Get the training you need -- in your own time frame -- with the interactive new NFPA 80 (2016) Balancing Safety and Security with Fire Doors, Dampers and Door Locking Online Training Series. Compliance with NFPA 80, Standard for Fire Doors and Other Opening Protectives, is vital, and NFPA® provides the industry's best training in a flexible, affordable, and relevant format. Whether you're a facility manager, building owner, engineer/designer, or AHJ responsible for building safety, you'll find the NFPA 80 training you need for job success in this self-paced series developed by the Code experts. These four modules help you identify specific requirements applicable to your work. Take the Introduction to NFPA 80, Fire Doors and Other Opening Protectives Online Training Course for a solid introduction to the scope and structure of NFPA 80. Then, continue with the course on how to locate, interpret, and correctly identify and apply the requirements for the inspection, testing, and maintenance of fire door assemblies. Wrap up with learning how to apply the requirements for fire dampers, smoke dampers, combination fire/smoke dampers, and permissible door locking arrangements. All courses offer a rich, interactive training experience, so you're ready to apply concepts on the job. Each one-hour course ends with an exam to test your knowledge. Complete this four-hour course and qualify for 0.4 CEUs. Completion of each individual one-hour course qualifies you for 0.1 CEU. Upon successful completion of a course or the course series, participants will be prompted to download the CEU certificate directly from the course site. Participants will demonstrate the ability to locate and apply the general requirements of NFPA 80. Continuing Education Credit: Complete this one-hour course and qualify for 0.1 CEU. Upon successful completion of a course, participants will be prompted to download the CEU certificate directly from the course site. 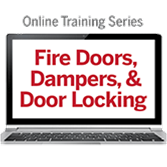 Take this online course to improve your ability to use NFPA 80, Standard for Fire Doors and Other Opening Protectives, to locate, interpret, and correctly identify and apply the requirements for the inspection, testing, and maintenance of fire door assemblies. This one-hour self-paced module is based on the 2016 edition of NFPA 80. Participants will demonstrate the ability to apply the requirements for fire dampers, smoke dampers, and combination fire/smoke dampers as required by NFPA 90A, NFPA 101®, and NFPA 5000®, and as presented in NFPA 80 and NFPA 105. Participants will demonstrate the ability to apply the requirements for permissible door locking arrangements.